Summer Shrimp Tomato Salad makes the most of summer fresh produce. 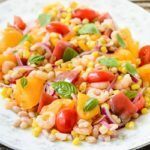 It's heirloom tomatoes, corn, beans, onion, and shrimp tossed with a citrus dressing. Whisk together nectarine juice, jalapeño peppers, honey, lime juice, lemon zest, and ginger paste in a large bowl. Add corn, navy beans, shrimp, and onion. Gently stir or toss to combine. Cut tomatoes into bite-sized pieces. Add to bowl and gently toss to combine. Garnish with basil. Serve immediately. You can use a variety of tomatoes including heirlooms, grape, cherry, pear, plum, or whatever is fresh and available from your garden or local market.